In this study, the possible causal links between the built environment, travel attitudes and travel behaviour of people that have moved between totally different urban and transportation contexts were investigated. A quasi-longitudinal design was developed to collect data about the perceived neighbourhood characteristics, neighbourhood preferences, travel attitudes and changes in car, walking and bicycle usage of 51 Greeks who relocated from the US to Greece. Variable reduction techniques were applied prior to developing our models because of the small sample size. The results of this study offer support for a causal relationship between the built environment and travel behaviour identified in the existing literature. 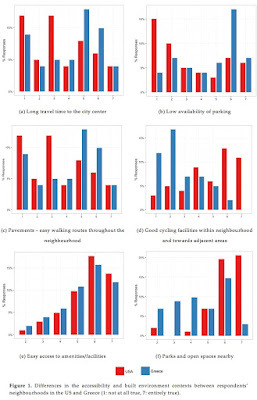 For instance, longer travel time to city center was associated with higher car use, higher density neighbourhoods and increased accessibility to local amenities were associated with increased bike use and better access to a district shopping center was associated with more walking after relocation. Our results also showed that in contexts like Greece, where transport infrastructures are not adequately developed, lack of safe bike conditions and easy access to public transportation are important determinants of bicycle use and walking. Thus, according to our results, promoting sustainable mobility in contexts like Greece would require not only enhancing accessibility through relocation of activities, but also by improving infrastructures for public transport, bicycle and walking.